Brother Jesse Blog: Vigilante Madness in Pearland...Not Just in Sanford, Not Just Trayvon Martin! Vigilante Madness in Pearland...Not Just in Sanford, Not Just Trayvon Martin! (Source: Forward Times) It was just another Tuesday evening in a normally quiet neighborhood in Pearland, Texas, where kids are often found playing with one another and driving go-carts. A family had just returned from Galveston on a spring break excursion, when upon their return, all of a sudden the unthinkable happened. 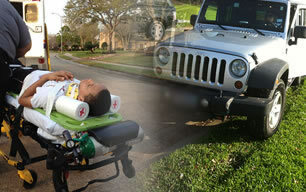 “You don’t belong in this neighborhood!” These are the words that Jules Moor, a 13-year old black child, says that Deanna Johnson, a middle-aged white female, said to him after Johnson slammed her 2011 Jeep Wrangler into his go-cart on Tuesday, March 13, 2012. According to court documents obtained from Jules’ attorney, Sylvester Anderson, Jules went for a ride in his go-cart in his neighborhood with another 13-year old boy who had been spending spring break with the Moor family. A third minor boy, another friend of Jules’, rode a small bicycle behind the go-cart. Jules saw two cars behind him while driving back home, so he decided to drive his go-cart completely off the road to his right onto the grassy edge of the neighborhood park to avoid being in the way of traffic. It is then that Jules states that Johnson swung her vehicle across the south-bound lane of the road, ran over the curb onto the grass and deliberately and intentionally rammed her vehicle head-on into the go-cart.